To view portraits currently for sale at Philip Mould & Co, please go to www.philipmould.com. This portrait is an important addition to the work of Robert Home, the leading Anglo-Indian artist. It was painted in India, probably in the early nineteenth Century, and is one of very few instances of an Indian portrait showing a musician. The sitter was evidently the daughter of a wealthy merchant or colonial administrator, but present research has been unable to firmly establish her identity. One of a set of three recently discovered portraits by Home, this portrait descended in the Mackeson family in Kent. Some members of this family, such as Frederick Mackeson (1807-1853), served in the East Indian Company. Robert Home was one of the most successful English portraitists working in Calcutta at the end of the eighteenth century. His evocative and coolly atmospheric portraits afford us a rare glimpse of daily life for the British in India, at a time when Britain’s position in the subcontinent was undergoing a dramatic change. 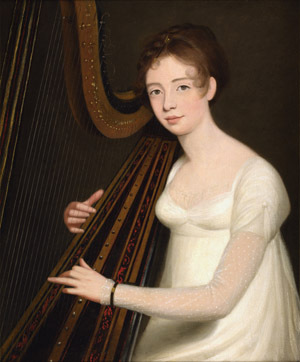 Home first studied painting under Angelica Kauffman, R.A., and began to exhibit at the Royal Academy in 1780. He worked in both Italy and Ireland before sailing to India in 1790, where he accompanied the army of Lord Cornwallis as official artist during the arduous campaign against Tipu Sultan. By June 1795 Home had established a successful studio in Calcutta. In October it was reported that he ‘was much employed, and has handsome prices, I hear’. This is confirmed by his sitters’ book, which is preserved in the National Portrait Gallery, London. His standard charge was 500 rupees (£60) for a head, and 2,000 rupees (£240) for a full-length portrait. In addition to his commissions from wealthy East India Company civilians, Home painted several portraits of Marquis Wellesley, of Lord Minto (who succeeded him as Governor-General), and of the Marquis’s brother Arthur, later Duke of Wellington; he also portrayed a number of military commanders and high court judges. Among his patrons was the diarist William Hickey, who observed that in 1804 Home was ‘then deemed to be the best artist in Asia’. He was also an able draughtsman: his 'Select Views in Mysore, the Country of Tippoo Sultan' were published in London and Madras in 1794, and in Calcutta he made 215 watercolours of Indian mammals, birds and reptiles, some of which were also worked up as oils. In 1814 Robert Home (who was now in his sixties) left Calcutta for Lucknow, and became court painter to the Nawab (later King) Ghazi-ud-din Haidar of Oudh. Here he was employed not only in portraiture but in designing furniture, regalia and howdahs. He received an annual salary of £2,000. When the King died in 1827 Home retired with his married daughter to a ‘handsome establishment’ at Cawnpore (Kanpur), where he died at the age of 82, having spent most of his long life in India.